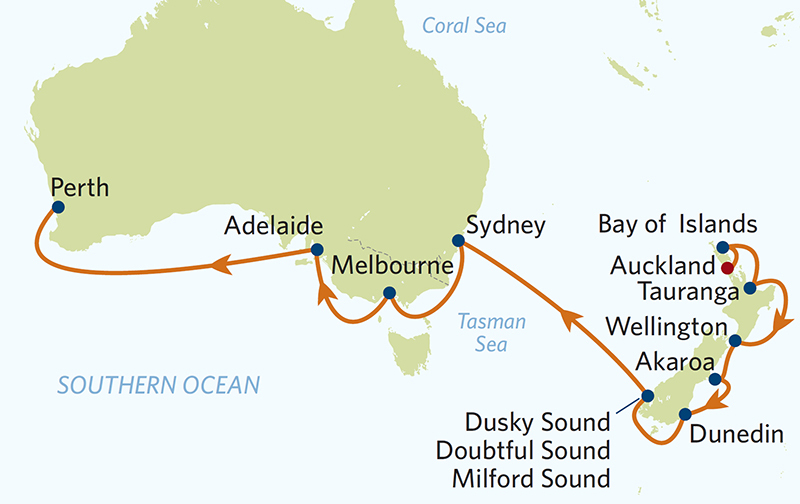 A one way cruise from Auckland, New Zealand to Fremantle, Western Australia. A fantastic way to see much of two countries and to learn from some of the world’s top genealogists on our biggest cruise ever. More details, for pricing and booking form to be added shortly – and leading speakers soon after. This cruise visits most of the leading cities and other places of significance in New Zealand and Australia, including the world class fjordlands of southern New Zealand. Ship: Celebrity Solstice. The 4.5 star Celebrity Solstice is rated by many as one of the finest ships operating in Australia by any of the major cruise lines. Why not add on the Barrier Reef cruise for a great value two-cruise package – perfectly timed to start three days after the Auckland–Fremantle cruise finishes. Add Queensland for an even more comprehensive coverage of two countries.